Monitoring for pigging process of oil West-East gas pipelines - Dynatronic Corporation Ltd.
Brief introduction: Our company is invited by the China Petroleum Pipe Institute to participate in the monitoring of the pigging process of the West-East Gas Pipeline, mainly to monitor the changes about the pipeline pressure and pipeline diameter at the exit, so that construction personnel can take appropriate measures to avoid pipeline burst accidents. Our company utilizes the DE-944 dynamic signal test system, DH801 pull-wire displacement sensor, and NS-B pressure sensor to give full play to the advantage that the DE-944 can remotely perform telemetry through network communication to avoid personnel approaching the danger test site. After 39 hours of continuous monitoring, data with practical significance were collected, pressure changes in the pigging process were observed in real time, and measures were taken in time to ensure that the pigging work was completed safely and smoothly. 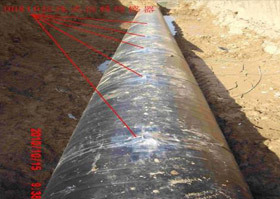 The whole process is long and complicated, and the DE-944 dynamic test system works well and the collected data is real and reliable, which is recognized by the China Petroleum Pipe and Tube Research Institute.